Out of the blue, my brother-in-law proposed to his long term girlfriend and to celebrate, we were invited to a pub outing and dinner at The White Horse in Harpenden. The pub is situated on the edge of Harpenden next to idyllic houses and greens and fits in nicely in the area. The garden area is extensive and well looked after. The inside blends modern with rustic giving it a homely feel so it suits all seasons. As it was a warm evening with a bright blue sky, we opted to eat outside. So after the chinking of the champagne glasses filled with prosecco, it was time to order dinner. 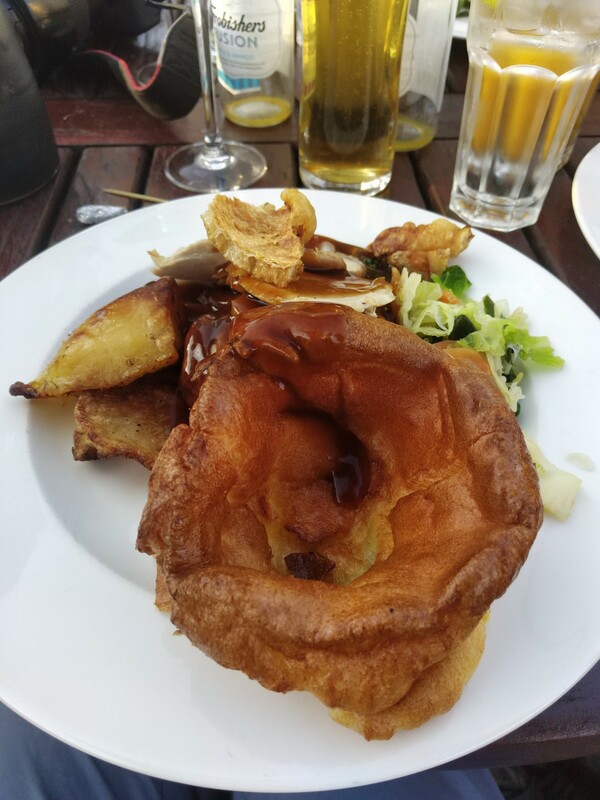 The weather put paid to the availability of the menu, not because it was spoiled, but due to the pub being extremely busy over that weekend. We both opted for the pork roast with crackling and all the trimmings. As you can see, the portion size is good and you definitely get your moneys worth. 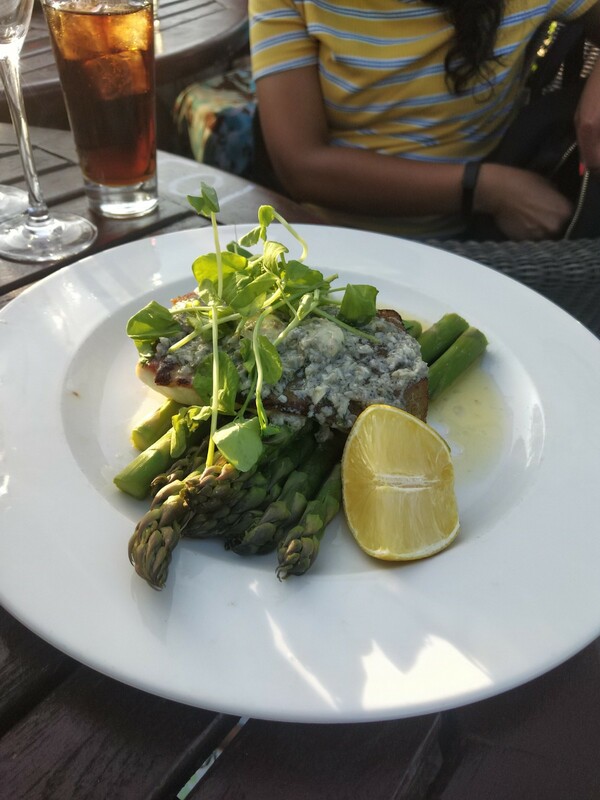 My mother-in-law is a little fussy when it comes to ordering restaurant food and not all that keen on English/European food so she had Halibut with Asparagus and vegetables which isn't on the menu but the The White Horse was more than willing and capable to tailor a dish to her needs. 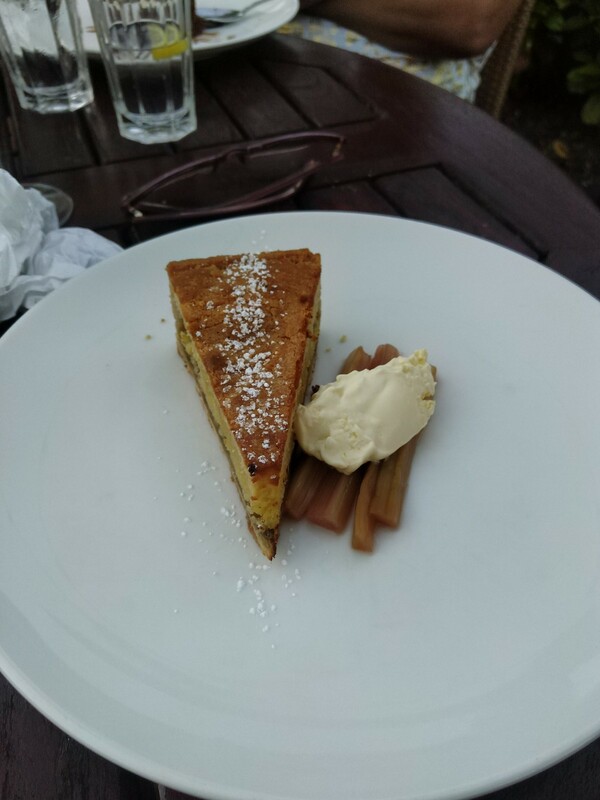 Even though we managed to polish off our mains and feeling quite full, there is always room for pudding and we were enticed by the Rhubarb and Almond Pie which was amazing. The almond pie was warm and soft which complemented well with the strips of rhubarb and the dollop of clotted cream. This pub is recommended if you're in the area and is a nice place for large groups to come together.